Not all amphibious tours are the same. 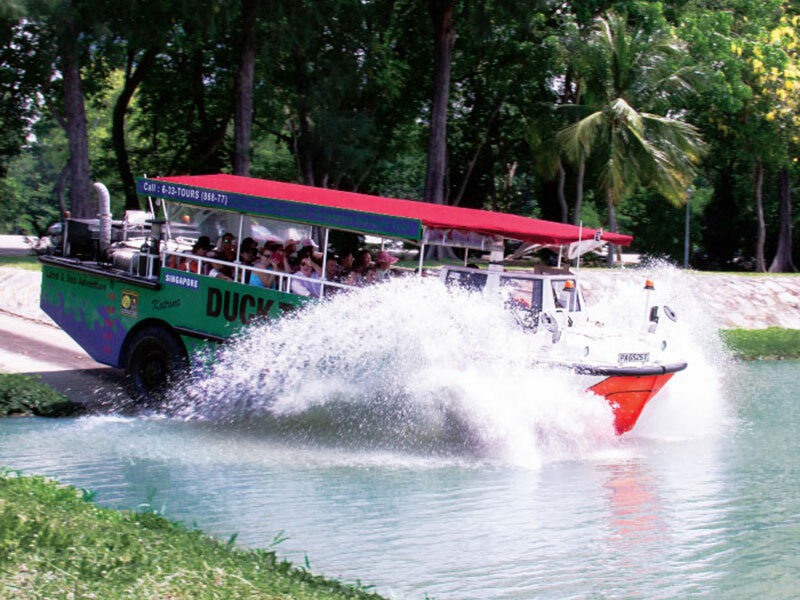 The Original DUCKtours @ Suntec City is the Singapore Tourism Award Winning Attraction. 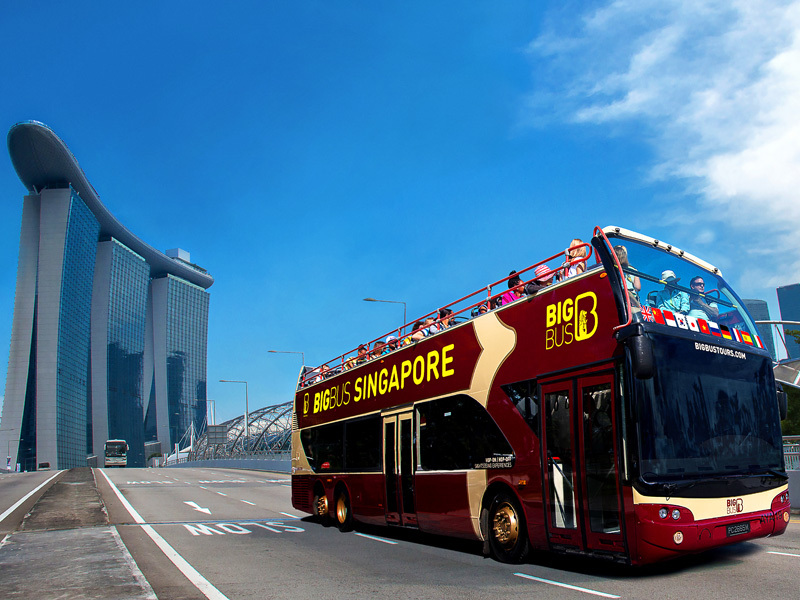 First in Singapore, an impressive 15 year perfect safety record, and 1 million passengers – nothing comes close to the Original DUCKtours @ Suntec City. This hour-long adventure start with a city tour of the historical Civic District, before splashing into the water and swimming off like a duck for a picturesque harbour tour. 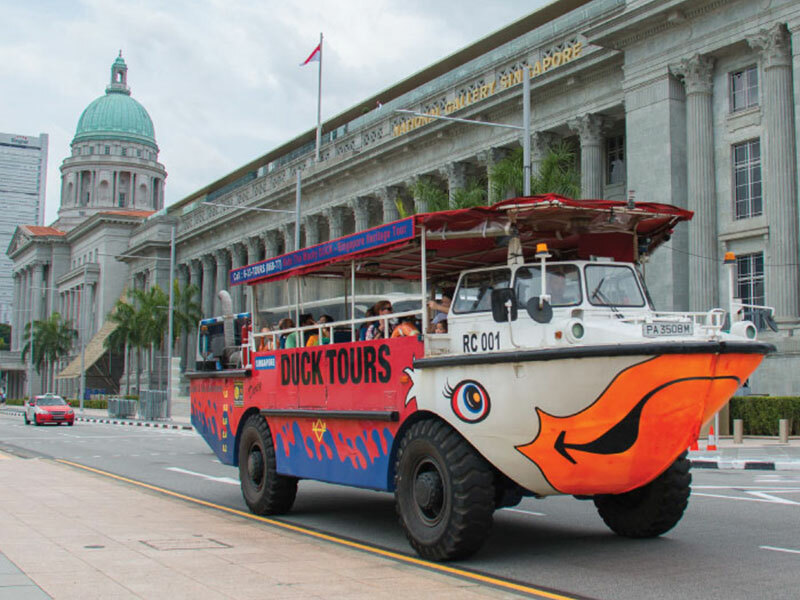 Climb aboard a refurbished WWII amphibious vehicle from Vietnam for a unique tour of Singapore. 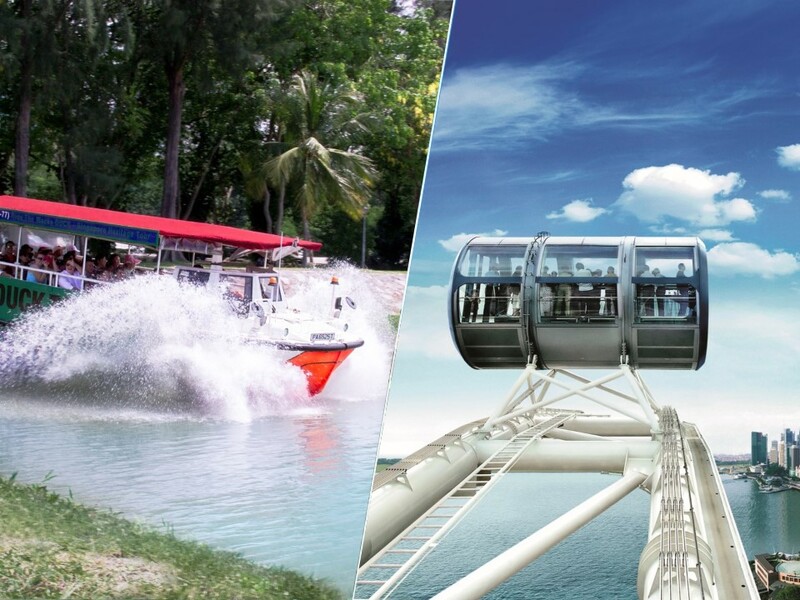 Depart from Suntec City, and start your land and water adventure with a big splash into the Marina Bay! Cruise along Marina Bay, where you can admire views of the bustling urban city's skyline and marvel at Singapore's most iconic landmark—the Marina Bay Sands, Gardens by the Bay, the Esplanade Theatre and the towering Merlion. Splashing into the Marina Bay! Waddle up on to dry land! Civic District – drive through the Civic District, see the Old Supreme Court, the Cenotaph war memorial and the historic Padang. “Live” Tour Guide for DUCKtour. English Guided Tours - Hourly departures from 10am to 6pm (daily). Mandarin Guided Tours - 10:30am, 11:30am, 12:30pm, 3pm, 4:30pm, 5:30pm (daily). DUCKtours is not wheelchair accessible. Toddlers below 3 years old are chargeable at $10.00 *. * It is a requirement to count every guest onboard whether a 10-year-old child or 10-day-old baby. Although the infant would be on a lap, we are unable to sell the seat that the infant would be purchasing because our total number of guests on board must be kept within the approved limit. How do I purchase tickets for the DUCKtours? 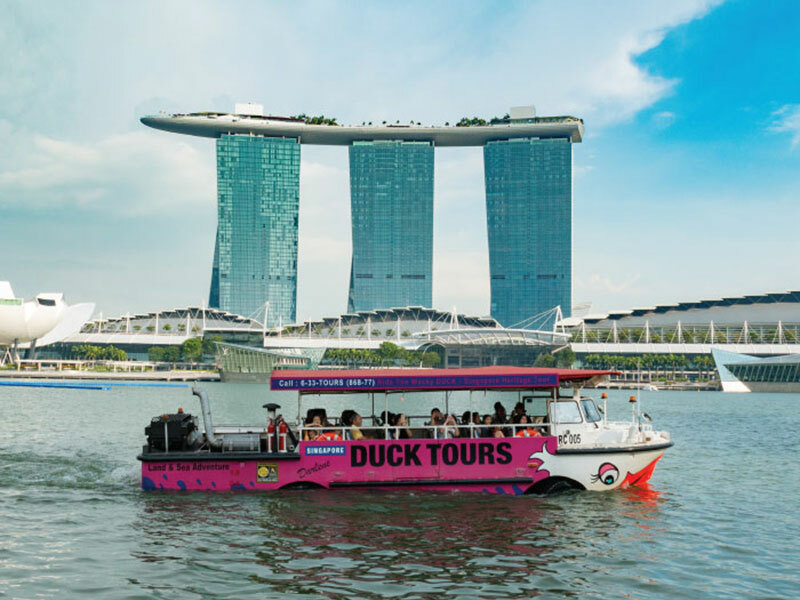 You can book online via this website or the official website at www.singaporeducktours.com or call our guest hotline at (+65) 6338 6877 for bookings and reservations. Can we purchase tickets for the DUCKtour in Singapore? YES! 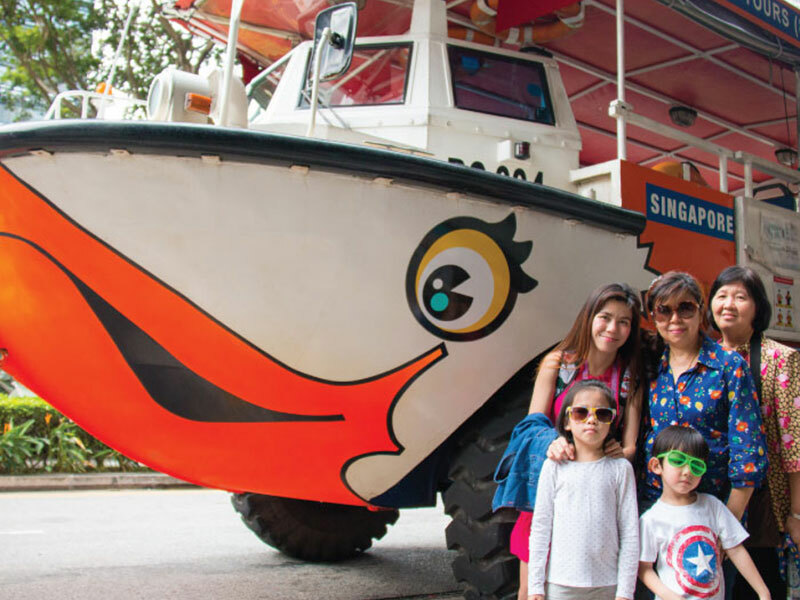 You can purchase tickets for the Ducktours at our DUCK & HiPPO counter at Suntec, Singapore Visitor Centre (orchard gateway@emerald), Changi Airport Terminal 1, 2 and 3 Arrival Meeting Hall. For help, please call our guest hotline at 6338 6877. 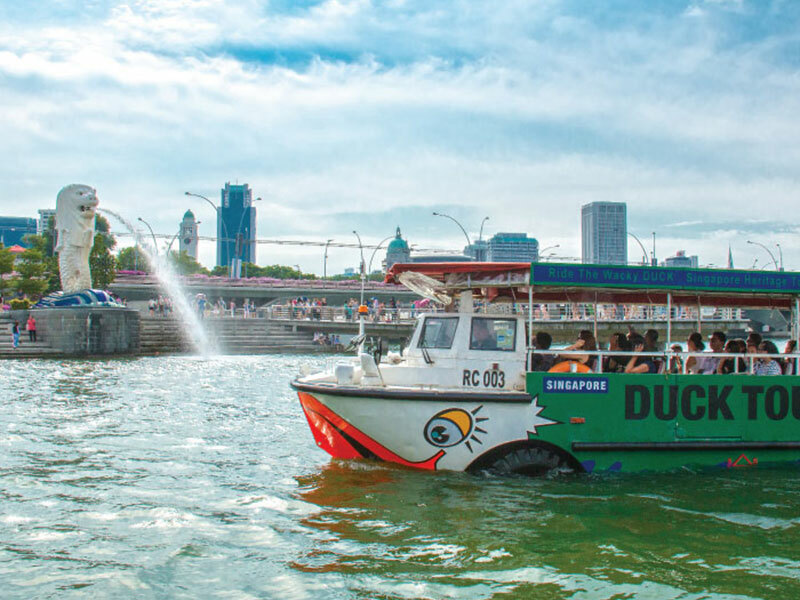 Are advance reservations required for the DUCKtours? We strongly recommend that you make advance reservations to avoid disappointment due to the limited capacity on the craft. What is the frequency of the DUCKtours? What will I get to see on the DUCKtours? Sure! We are happy to change your tour date (as long as you notify us at least 1 day before your current tour date) but please note that due to limited seat capacity, seats are subject to availability. If you would like to change your tour date, let us know at least 1 working day PRIOR to your departure date so we can reschedule it for you. Any unused tickets are not exchangeable for cash/credit.